The most famous of Moscow tram routes is, of course, the A route. The Muscovites name this route 'Annushka', that is equal to 'Annie' in English. 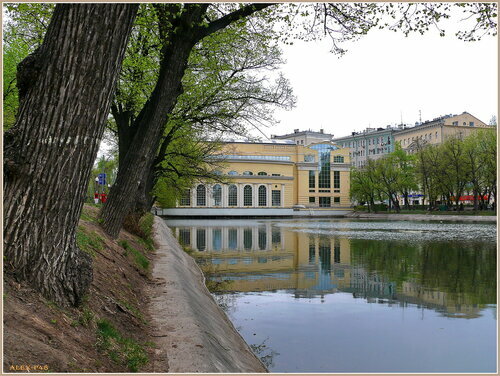 This route was initially opened in 1911 as a circular line along the whole arc of ten central boulevards of Moscow (Bulvarnoye Koltso, or Boulevard Ring) and three central embankments of Moskva river, namely Pretchistenskaya, Kremlyovskaya and Moskvoretskaya ones. This configuration had existed until 1936 when tracks on the embankments were lifted. Two more years the route remained circular making use of provisional bypass tracks, but finally the circle was broken because of the started reconstruction of bridges across Moskva river and Annushka became an ordinary linear route. In the following decades the route underwent a number of changes caused by the constant closures of lines in the central and western districts of Moscow. Trams left forever the western part of Boulevard Ring in 1949, and more redirections and shortings followed. Finally, in 1971 the only parts of the once great route were tracks in three boulevards and the line in Novokuznetskaya Street. However, this short route, the whole length of which was also shared by two more routes (#3 and #39), existed unchanged until 1991, when suddenly the reversing loop in Zatsepa Square used by Annushka was closed. The reason for this closure was that the loop encircled a religious building that had been restituted to the Russian orthodox church and her representatives claimed that trams produced untolerable noises. Thus, Annushka just could not celebrate its 80th birthday that year, and the route imperceptibly disappeared from the map.. The tramway took part in literature life of the city. 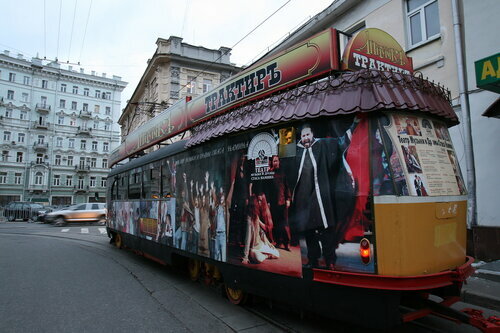 Bulgakov, Ilf and Petrov, Okudzhava and Paustovsky wrote about this famous tram. Paustovsky used to work as a conductor in his youth. He used to recall how the tram ran around the city. But the red tram hasn’t been running around the city for a long time. During the city’ reconstruction the route was changed not once. Today, you can meet the “A” tram in three out of ten routes but it still runs through interesting parts of the city. So, let’s start. First of all, there is Chistoprudny bulvar. Legendary, there used to be a village Kuchki which is connected with the Moscow’s foundation. Slaughtermen worked near Chistye prudy (Clean ponds) in ancient times. Waste products drained into the ponds so they were called Poganye – Unclean. Menshikov bought an estate near the ponds at the beginning of the 18th century and ordered to clean the reservoirs. Since that time they have been known as Chistye – Clean. The Yusopov’s House is worth paying attention. Two-storey chambers with a “ginger-bread house” on the top are a bright sample of the 17th century’s architecture. A prince Grigory Dmitrievich – a Peter the Great’s general – made the illustrious name wealthy. He was presented the house for distinguished services. Then we cross Pokrovka street. Barashevskaya settlement was situated in the region in the 17th century. The street was named after Pokrovskie Vorota (Gates) of the White town. The street is decorated in different styles what is very common for Moscow. Then we see a building of a former apartment house that belonged to a corn chandler Rakhmanov. One of the first apartment houses in the city was built in modern style. It is distinguished by its fretwork: peculiar masks, outlandish patterns, bas-reliefs - modest girls with sinking eyes. One of the best constructions, performed by Rastrelli in 1472 by order of Elizabeth, stands nearby. Its unusual architectural style reminds of the 19th century’s chest of drawers. It was built for a prince Trubetskoy and the owner of the house was often called “Trubetskoy - a chest of drawers”. They say, Elizabeth celebrated her wedding with a count Razumovsky in the house. Legendary, they got married in a church of the Resurrection standing near. 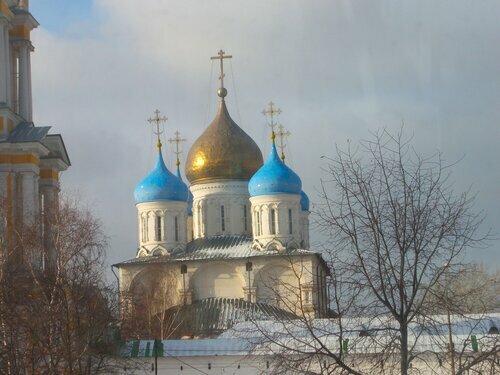 In honour of the event the church was decorated with a cupola in the shape of a tsar’s crown. The building, erected in 1652, is interesting also for combination of baroque and Old-Moscow styles. We are already at the Pokrovskie Vorota (Gates). The square was constructed at the end of the 18th century. 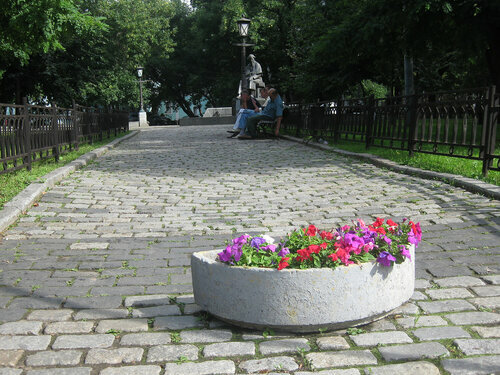 It is decorated with a cozy mini-park and there is located one of the most ancient Russian drugstores, opened in 1703. “Yauzskie vorota” is the next stop. Be sure to visit St. Peter and Paul’s church erected at the beginning of the 18th century: carved ornaments, gorgeous decoration in Moscow baroque style agree with a simple bell tower. A curios tourist will be also impressed with the interior of the church where a famous Bogolubskaya icon of the Holy Virgin, reliquiae of St. Peter and the icons of Assumption are kept. Then the tram brings us over the Yauza River to Zamoskvorechye (behind the Moskva River region). This quiet region was settled by merchants in the 19th century. It was they who formed Zamoskvorechye’s present image. One of its attractions is St. George’s in Endov church that was erected in 1653. Endova is a bowl in a boat shape which was used in ancient Russia. 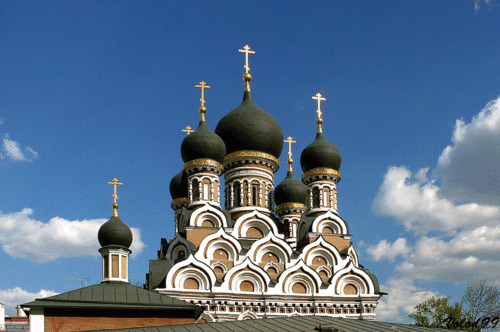 According to a version, the church got its name from “a tsar’s tavern for oprichnina officials” (oprichnina – political and administrative apparatus established by Ivan IV). A red and white building is decorated in common for that time style of tracery. The church is also distinguished by a thee-level Gothic bell tower (1806). Novokuznetskaya street is a bright representative of merchants’ Moscow. It is tasteless and meanwhile cozy. It is indicative that there is a church of Old Belivers. Many merchants were Old Believers. Feodosiya Morozova – a famous follower of this religion – contributed much to the cathedral’s construction of 1909. The building combines the elements of Byzantium and Old-Russian architecture. There are a lot of such constructions performed in various styles at a time. They make the street unique and charming. No wonder, writers liked the region so much. Lev Tolstoy rented a house on Pyatnitskaya, 12 which runs parallel to Novokuznetskaya street. Nowadays, the house is the writer’s museum. Esenin also lived in the region; he rented a flat in the house of a merchant Krylov. It is one of the tram’s stops. Danilovsky val is the terminus. Following Dubininskaya Street the tram brings you to the terminus – Danilovsky val, where St. Daniel’s monastery is situated. It was established in 1272 by a prince Daniil Alexandrovich. He was buried here. Ivan Kalita (Money Bag) moved the monastery into the Kremlin and the construction was empty for a long time. Ivan the Terrible revived the monastery when in his presence a dying child was cured near St. Daniel’s grave. The monastery was always patronized by Russian sovereigns. That’s why it is so ornate and splendid. Today, the monastery is a big complex with a hospital, a graveyard and churches.